How can you comply with the law if you smoke? 1.- .- You should be conscious that your smoke is not only annoying, but it’s also a toxic element that causes sicknesses. Respect the norm from the beginning, and IF YOU WISH TO SMOKE, GO OUTSIDE. With your responsible behavior, you will contribute to the compliance of the law, be able to share smoke-free spaces with others, and avoid the possibility of having to pay sanctions for breaking the law. Since January 2, 2011, 257 million Europeans interact with each other, eat in restaurants and have fun in smoke-free bars and discos. 1.- You only inhale 15% of all the smoke that your cigarette produces; the other 85% between puffs goes into the environment, forcing everyone around you to smoke it. 2.- Involuntary exposure to tobacco smoke for any non-smoker is equivalent to them actively smoking two or three cigarettes. 3.- Tobacco smoke from your cigarettes negatively affects THOSE PEOPLE WITH YOU, especially their lungs and their cardiovascular system, increasing their risk of cancer, heart attack, and brain hemorrhages. 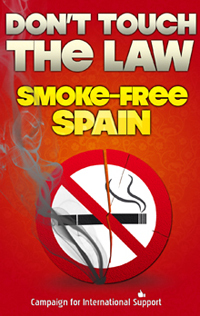 4.- In Spain, more than 3,200 NON-SMOKERS die annually from secondhand smoke that they inhale in closed indoor places, including the home or cars. This number is HIGHER THAN THOSE KILLED IN TRAFFIC ACCIDENTS. 5.- Smoke-free places help you to better moderate your tobacco use. 6.- If you avoid smoking in front of non-smokers and above all in front of minors and hospitality workers, you’ll show RESPECT AND RESPONSIBILITY. Smokers are key in smoke-free laws. Join the movement and the other people who understand public health and social health as a basic human right.